NORMANDY, FRANCE – Clowns to the left of us… jokers to the right – what a hoot it is to watch them jump and howl. Trade barriers… LGBT bathroom policies… the Dow… Elizabeth Warren… Rudolph Giuliani… unemployment… QT [quantitative tightening]… Canadians sneaking across the border to buy our shoes – there’s no shortage of louche entertainment in yesterday’s events. But what about tomorrow? We learn from the papers that computers can beat us at chess, write better essays, and drive our cars. On October 17, 2018, all your favorite Bonner & Partners editors will be flying into Bermuda for the largest conference we’ve ever held. 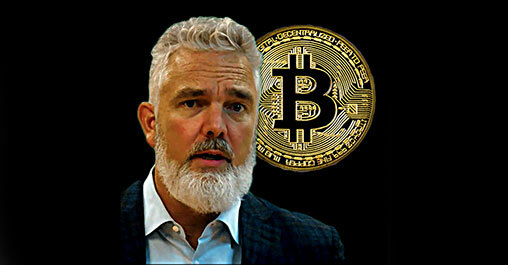 The speaker list will include some of the greatest investors in the world covering the topics they know best. Plus, you’ll get to hear from John Stossel and special guest Glenn Beck. Register today and receive a $1,000 voucher to use toward any investment research service offered by us or our seven partner companies. Alas, these same computers can also pick our face out of a crowd… cancel our credit cards… and take away our passports. Using algorithms and Big Data, they can also identify us as “undesirable”… or worse. That’s when your editor sees the scaffold going up in front of him… and there is the hangman approaching with a noose in his hands. Last week, a couple of reports added to his soucis. First, the IRS announced that it would block passports for 362,000 Americans who are late on their taxes. From where in the Constitution does the tax collector get the right to confine citizens who have never been convicted of a crime? We don’t know. We believe our own accounts with the IRS are in good order. But the “tax code” had 74,608 pages in 2016; there is plenty of room for disagreement, ambiguity, and interpretation. Our own tax return is more than two inches thick. It is prepared by professionals. Could they make a mistake? Of course, they could. Could the IRS make a mistake… or worse, intentionally try to make life difficult for us? It would never do such a thing, you say. In 2013, the IRS apologized for targeting conservative groups for extensive auditing. It admitted that it had given especially harsh treatment to groups with “tea party” or “patriot” in their names and promised it wouldn’t do it again. Of course, it won’t. And it won’t make mistakes, either. Garibaldi Resources: +3,622% in 10 months. MBMI Resources: +1,400% in just over a year. Bell Copper: +636% in under 11 months. Six Sigma Metals: +3,300% in a year. Cobalt 27 Capital: +4,066% in about 4 months. Tesla’s ambitious CEO, Elon Musk, spent $5 billion to build this massive battery factory in the Nevada desert. It’s five times bigger than Central Park. And it can make 500,000 batteries a year, mostly for electric cars. Shortly after it opened, prices of the metals used to create batteries soared as high as 190%. And the best-performing companies that mined them soared even higher – as much as 4,066%. 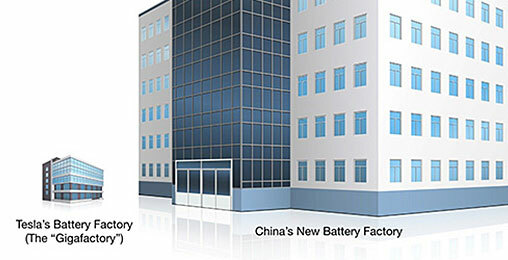 Now, as soon as August 16, China’s opening its own battery factory. When it opens – as soon as August 16 – how high could it send the prices of battery-grade metals (and shares of the companies that mine them)? Already, in addition to the IRS’s “no passport” list are the feds’ “no fly” and “hit” lists. An interesting feature of these lists is that you never know if you are on them… or why. The feds don’t have to prove anything. An interesting case arose recently wherein a man found out, apparently by accident, that the feds were trying to kill him. He went to a wedding in the Middle East… and in came a missile attack. Who were they shooting at? Then, he realized it was him! He thought it was an accident; the spooks had mistaken him for someone else. Meanwhile, in May, China officially began its “social credit” system. The idea is to amalgamate electronic sources of information on each of its 1.4 billion citizens and then target them for rewards or punishments, depending on their scores. Government documents show a plan to block poorly scored citizens from air or rail travel for up to a year, though perhaps less for minor infractions like leaving a bike parked on a footpath. More than 7 million citizens have already been blocked from travel, Human Rights Watch reports, for offenses like “insincere” apologies. For the first time in history, the internet, with its electronic surveillance, and the collusion of data accumulators – Google, Facebook, Amazon, and others – make it possible for the authorities to control and manipulate every aspect of life. Algorithms can now do what used to require whole squads of spooks, snitches, and sinister agents. Did you ever attend a meeting of the group Americans for Limited Government? Did you ever talk to a known undesirable? Do you believe Congress is run by a bunch of incompetent crooks? Do you read the Diary? Are you insincere? Put away the waterboards. Send the torches and pliers back to the tool shop. There is no longer any need to ask, let alone to torture. The feds already know everything. This summer, an expected Fed meeting could ignite an economic event affecting income investors, wiping out bond values, and cutting retirement income in half. But these 7 “unknown” stocks could keep you cash-rich during this crisis. The National Security Agency (NSA) has been monitoring our telephone conversations for years. Amazon, Facebook, Google, and others know what we do, what we want, and even what we think. And now, Big Technology is working with the feds to use this data to control us. In some cities, cameras scan train stations for China’s most wanted. Billboard-size displays show the faces of jaywalkers and list the names of people who don’t pay their debts. Facial recognition scanners guard the entrances to housing complexes. Already, China has an estimated 200 million surveillance cameras – four times as many as the United States. That’s just one piece of the system. The data flow in from GPS, social media, credit cards, banks, job sites – just about everywhere. Then, the feds can manipulate outcomes simply by editing the “news”… or denying access to important services… or applying individualized rewards or penalties. Even highway tolls can be adjusted for each car, depending on what behavior the authorities want to modify. Just 18 years ago, America’s five largest corporations were companies that provided essential goods and services – ExxonMobil, General Electric, Ford, General Motors, and Walmart. Now, the five largest corporations all truck in data: Apple, Amazon, Alphabet (Google), Microsoft, and Facebook. And they are using this data – in collusion with the feds – to create a Deep State paradise. Here at the Diary, we have a sunny disposition and undying faith in public officials. What do we have to worry about? After all, the “government is all of us,” Hillary Clinton assured us. It would never do anything that wasn’t for our own good, would it? We are serene… and overjoyed, of course. With so much new control, the Deep State will help us be better people… never jaywalking… never speeding… never trying to save on our taxes… and certainly, never, ever criticizing our democratically elected leaders, no matter what numbskulls they appear to be. In short, it will work like a lobotomy, helping us be model citizens. We’re all for it. Sincerely. In the golden years of the American middle class, one breadwinner could provide a good life for a family. There was also a predictable route to success: work hard, make more money, and move up in life. The chart below reflects this. It shows how inflation-adjusted wages and productivity increased in tandem during the golden years of the American middle class. In other words, the more productive you were, the more money you made. It was the key to social and income mobility… and it nurtured a healthy middle class. Then, something significant happened in 1971. It caused a dramatic split between work and wages. 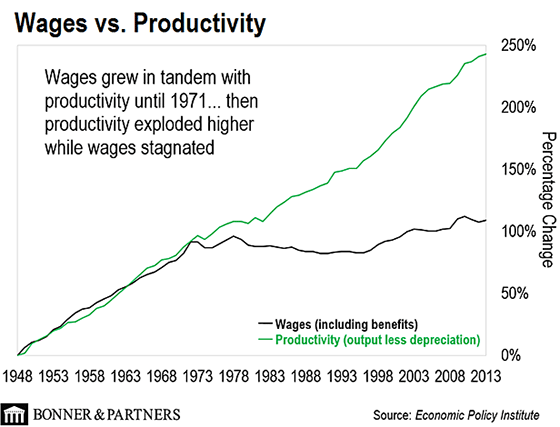 And as the chart below shows, the average person’s real wages have more or less stagnated since the early 1970s. It’s no coincidence that things started to go downhill for the middle class in the early 1970s – on August 15, 1971, to be exact. This is the date that President Nixon killed the last remnants of the gold standard. Since then, the dollar has been a pure fiat currency. This allows the Fed to print as many dollars as it pleases. And – without the gold standard to hold it in check – it does precisely that. As a result, living expenses have skyrocketed. Incomes have stagnated. And Americans have made up the difference with debt. Today, very few single breadwinners can support a family. The middle class is a shrinking minority. P.S. In a recent edition of The Casey Report, I showed readers the factors contributing to America’s shrinking middle class. I also revealed a strategy to help them land on the right side of the divide. 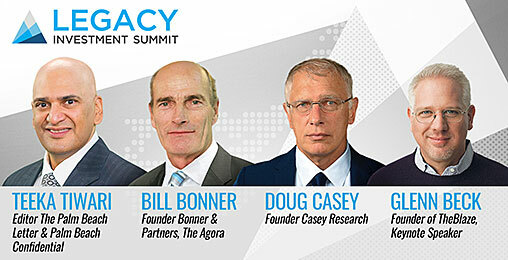 To join The Casey Report, and even get a book from Casey Research founder Doug Casey, go right here. What a treat for me today! Having photographed and/or videoed about 700 weddings since 1977, you are the wedding planner I would recommend. Thanks for your entertaining observations that remind me of so many that were well done and some that were not. As a grandfather who does very few weddings now, your words of wisdom will hopefully give some guidance (along with mine, if Grandpa is heard) to my five grandchildren who are yet to be married. Simply priceless! I wish I knew of some of these “tricks” for the many weddings I have attended. Your best column ever. I will hand this to each of my adult children when he or she announces the Big Day. Come on, Bill. “Generally, you speak with the person on your right during the first course… and with the person on your left during the second. Or vice versa.” Take a moment. This won’t work. Ha ha. DID YOU SEE JEFF BROWN’S UPDATE? Follow best-selling financial writer Bill Bonner as he reveals how Wall Street… Washington… and the business world truly operate.